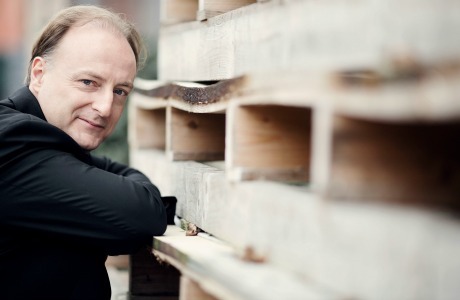 The Swiss, Germany-based conductor Christoph-Mathias Mueller should be familiar to the Egyptian audience, never mind how well-known he is on the international music scene. In Egypt as elsewhere throughout his career Mueller has made imprints on several levels. His biography includes numerous impressive achievements, among them serving as an assistant conductor to Vladimir Ashkenazy at the Deutsches Symphonie-Orchester in Berlin and to Claudio Abbado at the Gustav Mahler Youth Orchestra and the Lucerne Festival Orchestra. Since 2005, Mueller has been Principal Conductor, Artistic Director and, since 2007, General Music Director of the Gottinger Symphony Orchestra, a post that he holds until today. Apart from this impressive biography, Mueller is a returning conductor with many renowned orchestras around the world. What makes Egyptian listeners well acquainted with this accomplished musician is the fact that in the 2004-2005 season, Mueller was the Cairo Symphony Orchestra’s Music Director and principal conductor. Ever since this time, he revisited Egypt on a number of occasions, conducting in Cairo and Alexandria. 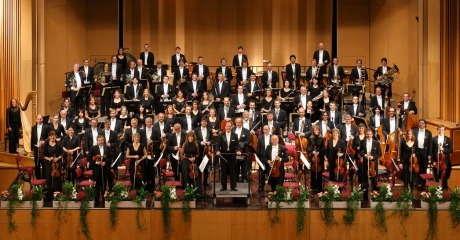 His most recent concerts with the Cairo Symphony Orchestra took place on 18 and 19 March, in an evening dubbed the Spring Concert, part of the Family Concerts series. Its programme included a lovely set of compositions targeting the whole family: fragments from Bizet/Guiraud’s Carmen Suite No. 1, Sarasate’s Carmen Fantasy, Massenet’s Meditation from Opera Thais, Brahms’ Hungarian Dances (No. 1, 3 and 5) and Offenbach’s Can Can from Operetta Orpheus in the Underworld, among others. Attending a concert conducted by Mueller is an undoubted boon. Even though Mueller’s musical luggage incorporates much more demanding works, he managed to turn this evening to an accessibly profound experience. And, regardless the programme, it was fascinating to watch how his expertise, experience, understanding of music, conducting craft and unimposing yet apparent self-confidence all translated into one musical evening. My later conversation with Mueller uncovered a passionate musician, a profound artist with a sense of humour and a human being who not only lives through music but who always finds a way to invite the listeners to share the privilege with him. “My parents come from modest backgrounds; they were not musicians but they always loved music. Also, as primary school teachers they had to know the basics of music, play recorder, piano a little bit… My mother always sang a lot,” Mueller reveals, underlining that classical music, especially from the Baroque era, was always predominant in his household. His sister has become a professional musician, playing oboe in an orchestra. Growing up in this environment, not only was music a natural part of his life, it also became a powerful part of his early development. “Since early years I would collect LPs and today I have many of them. I would also do music quizzes with my mother, telling her to listen to fragments from different compositions and then asking her to recognise the composer, music period etc,” he recalls how his passion for music was sometimes translated into “terrorising the family” with his inquiries, musical games and, above all, testing his knowledge. Born in Peru but growing up in Switzerland, Mueller was privileged to receive a solid basic music education at school. In addition, he taught himself how to play piano. “Then I started taking violin lessons with a private tutor, which continued throughout my school years. I started composing, conducting the school orchestra,“ Mueller continues, adding that he eventually received high certificates in violin, and began earning a living with this instrument, giving solo concerts and playing in orchestras. In the meantime, however, conducting was his unique calling. Already during Mueller’s violin studies, he conducted his contemporary music ensemble. Though he was interested in this career, he knew it would not be a bed of roses, requiring a lot of work and even more luck. However, following the advice of his chamber music teacher, at the age of 25, Mueller decided to embark on conducting studies at Cincinnati, Ohio. He then became a Conducting Fellow in Tanglewood, Massachusetts, and worked with Seiji Ozawa, Robert Spano and Leon Fleisher. “It was all very new to me in the USA. But the important part of this experience was that unlike conducting studies in Europe, where a student can practice with a larger ensemble once a semester or so, in the USA I was able to conduct a student orchestra every week,” he underscores importance of intensified practice since all young conductors learn from the many mistakes they make at the formative stage. Mueller spent a total of three years in the States, supplementing his conducting studies with playing the violin. It was in 1996 that he was offered the opportunity to be assistant to the renowned conductor Vladimir Ashkenazy in Berlin, a development he considers decisive in clarifying the path of his career. Two years later, Mueller was offered to assist Claudio Abbado in the Berlin Philharmonic orchestra’s performance of Mahler’s Symphony no. 2, a work which in its finale includes wind orchestra (banda) playing backstage, giving a unique sensation of distant sounds. It goes without saying that an opportunity to work with Abbado (1933- 2014), one of the best known conductors of the 20th century, was an important sign of recognition. As the orchestra travelled with this programme, Mueller got closer to the musicians, who eventually invited him to conduct an ensemble of their own in contemporary works. “Abbado attended my concert with those musicians when we performed in the Salzburg Easter Festival. I asked him for his opinion. One thing led to another and when back in Berlin he offered that I assist him in conducting the Gustav Mahler Youth Orchestra [2001-2005] and the Lucerne Festival Orchestra [2003-2005]. I worked with Abbado for a total of five years and it was an amazing time,” Mueller recalls, pointing to the many new lessons he learnt from this artistic journey. “American conducting training focuses on clear beat and follows certain patterns in the score. In Europe, where the American technique of conducting is even sometimes frowned upon, the musicians stress expressing the music in a more evocative way. I learnt a lot from Abbado, for instance how to modulate a musical phrase. What he was also doing incredibly was that he always knew exactly where to place a breathing moment with the orchestra. I loved his colours too. He actually could be quite precise when he wanted to and, especially in his later years, he became very reduced in his conducting,” Mueller explains. 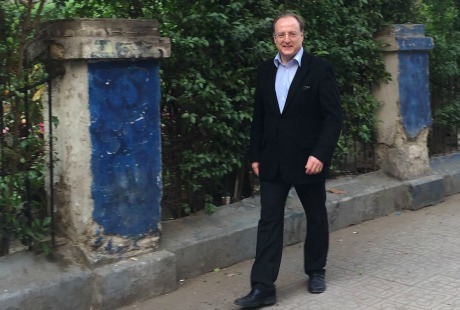 It is with this package of experiences that Mueller came to Egypt for the first time, becoming music director and principal conductor of the Cairo Symphony Orchestra (2004-2005). Today, as he embraces one decade of his on-and-off relation with Egypt, he underlines his admiration for Cairo as a city, its people and food, and shares his observations on the orchestra. “When I came here for the first time, I already could see the potential. Cairo has a very nice opera building, backstage, rehearsal room, etc. The infrastructure is really good, better than many other buildings housing an orchestra that I know. It also has many talented young Egyptian musicians who at the time had a chance to play next to older and more experienced colleagues, and several foreign orchestra members,” he comments. In 2005, Mueller completed his one year stay with the Cairo Symphony Orchestra. In Germany, he was offered the position of the Principal Conductor and Artistic Director of Germany’s Gottinger Symphony Orchestra, a post he has held to date. He speaks very highly of the musicians and the synergy he managed to develop with this remarkable ensemble. It is with Gottinger that Mueller practices his managerial skills. He underlines that though as a manager he learnt from observing other conductors, he does not necessarily choose to copy all their techniques. Mueller adopts a formula which, he believes, brings a lot of musical gains. Mueller explains that while any conductor and orchestra director has a lot of power, it is also a huge responsibility as one has to always strike a balance between creating music and seeing the humans behind it. “Some conductors can be quite hard on the musicians, especially when they dismiss them for not reaching the standard expected by the conductor. This school of management seems extremely tough to my taste, especially when you realise how many dreams can be shattered in a matter of seconds,” he references the well practiced strategy of Abbado and many others. Underscoring his admiration for Abbado’s musical power, Mueller explains that he nonetheless feels more comfortable with a different kind of management. He keeps underlining the importance of people whose whole careers and life paths can often depend, in a positive and negative sense alike, on one managerial decision or a few words uttered during even a short, one-time collaboration. Still, managing the orchestra is only one aspect of Mueller’s work. His passion is encapsulated in conducting, standing on the podium and leading the orchestra through the most captivating musical experiences. However, Mueller adds, coordination becomes more complicated when for example rhythm steps in. “Imagine 80 musician who might be required to start playing at the exact same moment. The conductor needs to prepare motion,” Mueller explains the breathing technique which is often used by conductors when directing the musicians. Mueller elaborates on the music magic, adding that the depth and/or the character of the relationship between a conductor and an orchestra is part of the equation. “The magic can happen from the very first encounter with the orchestra and music, pretty much like when you meet this one very special person. It can also come with time as you develop a longer relationship with the orchestra. It can also be that you feel magic at first but then it disappears somehow,” Mueller keeps comparing music, conducting and the whole artistic experience to the complex relationships between humans. As he continues to talk about his craft, his striking passion for music emerges through every sentence. Evidently, Mueller lives with and within music which becomes the medium he probably cherishes the most. While he was lucky to learn from masters in the field, as much as he learnt from them, he has also shaped his own distinctive conducting vocabulary. When on stage, from the first breath given to the orchestra one can clearly recognise knowledge, expertise, experiences and above all passion. As if infusing the soul to the score, Mueller meticulously sculpts the details; without forcefully imposing himself, he remains in control, generous and clear in transmitting his concept to the orchestra. At times he is extremely evocative without being showy, at other times very reduced without lacking vocabulary. He ends up extracting many colours in a programme that allows him to move in between many musical layers while adding a pinch of humour. Apart from pure sound, Mueller also pays a lot of attention to silence as one of the vital components of the musical creation. And on this journey of carving through the silence and tones, the audience can see how at times he pushes the orchestra, injecting power into its components, white at other times he seems to loosen the reins. It definitely needs a certain level of artistic maturity and confidence in the musicians to refrain from using body movement incessantly and allow the orchestra to carry the music forward. “I realise that on the podium, I am a very active conductor. Music has this very strong impact on me. With time, I learnt however that you do not need to do all for the orchestra; they can do it too. I feel that I am able to reduce more now. As you become older and more experienced, you realise that this way you still create your art. You are still there, you guide with your eyes, you are not losing anything. It takes time to realise that,” he comments. But Mueller also enjoys silence, as he shapes music and plays “little games” with the audience when the moment allows it. This was the case in the Cairo performance of Hungarian Dances. “It is also important for the musicians to feel different values in each concert. It breaks the monotony of presenting the same work throughout a number of evenings. It is interesting for the audience but also keeps the musicians somehow on their toes. Maybe it is about adding this element of surprise, of course as long as it is musically justified and doesn’t lead to any disasters,” he laughs. Undeniably, the conductor represents a crucial ring in the chain of collective artistic energy that fills the hall; it is a power which includes the composition, the orchestra, the conductor’s vision and the listeners. While Mueller cannot imagine life outside conducting and music at large, he considers himself very lucky. But he also realises that the career he chose can often be hard and filled with insecurity. 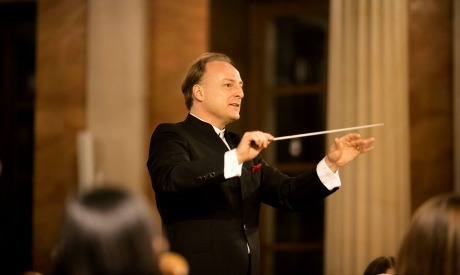 “Before my job in Germany, I was always a freelance conductor. I was lucky to have ‘good gigs’ as we call them, but there is no security; you never know what awaits you when you are old, etc.” He says that many conductors have to reinvent themselves, choose a career in education for example.